Neil Riordan, PA, PhD presented “Results From Panama Clinical Trials Using Human Umbilical Cord Tissue-Derived Mesenchymal Stem Cells (HUCT-MSCs) for Multiple Sclerosis and Autism” at the 5th Annual Perinatal Stem Cell Society Congress in Salt Lake City, UT on Thursday, February 28th. Neil Riordan, PA, PhD presented “Results From Panama Clinical Trials Using Human Umbilical Cord Tissue-Derived Mesenchymal Stem Cells (HUCT-MSCs) for Multiple Sclerosis and Autism” at the 5th Annual Perinatal Stem Cell Society Congress in Salt Lake City, UT on Thursday, February 28t. During his talk, Dr. Riordan discussed his recently published phase I/II clinical trial entitled, “Clinical feasibility of umbilical cord tissue-derived mesenchymal stem cells in the treatment of multiple sclerosis”. He also touched on his recently completed and soon-to-be-published phase 1/II clinical trial on autism, “Allogeneic Umbilical Cord Mesenchymal Stem Cell Therapy for Autism” (NCT02192749). In 2013, the International Perinatal Stem Cell Society, Inc. a non-profit (501(c)(3) organization was founded on the basic principle that stem cells from perinatal tissues contain enormous, untapped life potential to treat many diseases and disorders. Perinatal stem cell sources include: amnion, amniotic fluid, cord blood, cord tissue/wharton’s jelly, as well as placental blood and placental tissue. 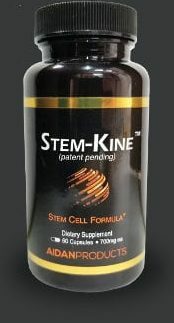 Perinatal stem cells are formed around the time of birth and are classified as adult stem cells but they really are more primitive then stem cells found in bone marrow or adipose tissue or other traditional sources of adult stem cells and as such, have greater therapeutic potential. Riordan Technologies strives to improve the human condition through innovation in scientific research, regenerative medicine, and stem cell therapy. Riordan Technologies comprises companies founded by Neil Riordan, PA, PhD: Dallas-based Aidan Products, Signature Biologics, and Riordan Medical Institute, and Panama-based Stem Cell Institute and Medistem Panama. On Sunday, February 24th, Fox 4 Sports in Dallas-Fort Worth aired a feature story about one of our patients, Sam Harrell. Sam is head football coach at Ennis High School in Texas. Sam was forced to retired from coaching several years ago due to multiple sclerosis but is now back on the field after receiving stem cell therapy in Panama. Congratulations to Dr. Riordan and everyone at Stem Cell Institute and Medistem Labs in Panama! Multiple Sclerosis News Today published its Top 10 Multiple Sclerosis Stories of 2018 and named Stem Cell Institute’s MS clinical trial its #4 top MS story of 2018. (Tempe, Arizona, October 2, 2018)–Southwest College of Naturopathic Medicine & Health Sciences team will cut the ribbon for the opening of the new Neil Riordan Center for Regenerative Medicine on November 15 at 4:00 p.m. This affiliation between SCNM and Neil H. Riordan, PA, PhD, a research leader in stem cell therapy, will accelerate the development of this safe and innovative option for the treatment of acute and chronic pain. The Neil Riordan Center for Regenerative Medicine is staffed by an interdisciplinary team of physicians, and housed in SCNM’s LEED Platinum certified Community Commons. Regenerative medicine, particularly autologous stem cell therapy, utilizes a patient’s own stem cells to promote healing, reduce inflammation and stimulate tissue repair. People with acute and chronic pain, including elite athletes, may benefit from the growth factors, natural anti-inflammatory activity, and regenerative properties of autologous stem cell therapy. Over 100 million Americans suffer from chronic pain at an annual cost estimated at exceeding $620 billion, the many of whom are currently treated using opioids. This has led to wide-spread abuse and addiction to prescription opioids and illicit drugs including heroin. Opioid addiction and abuse has been attributed to 37,000 deaths each year nationally and 1,763 deaths of Arizonans from opioid overdoses in the past fifteen months. Stem cell therapy promises to limit the reliance on opioids thereby decreasing the potential for opioid addiction and abuse. Neil Riordan, PA, PhD, is a pioneer in the field of applied stem cell research. In addition to collaboration with major universities in the United States, research and patient care is currently being conducted at Dr. Riordan’s other laboratories and clinics in Dallas, Texas and Panama City, Panama. 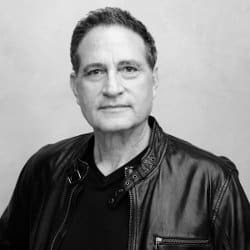 He is an author on more than seventy peer-reviewed research publications, including clinical studies that explore stem cell therapy’s potential in treating conditions such as autism, multiple sclerosis, and rheumatoid arthritis. 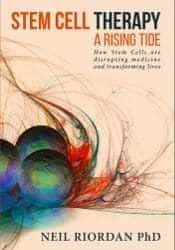 Dr. Riordan is the author of two books on stem cell therapy: Stem Cell Therapy: A Rising Tide – How Stem Cells are Disrupting Medicine and Changing Lives and MSC (Mesenchymal Stem Cells): Clinical Evidence Leading Medicine’s Next Frontier. We welcome any questions or comments. Please contact Kirsten Texler at k.texler@scnm.edu for more information. A leader in inspiring, teaching and providing multiple modalities in the scope of naturopathic medicine, Southwest College of Naturopathic Medicine not only educates but also elevates society’s awareness of the power of holistic medicine. Campus highlights include a fully accredited four-year naturopathic doctoral program, a robust medical clinic open to the public, a dedicated pain relief and regenerative medicine center, innovative and inspirational public events, an on-site medicinary and multiple opportunities for ground-breaking research. Additionally, the SCNM Sage Foundation highlights the focus on philanthropy instilled in students and faculty as they provide care for underserved communities in seven satellite locations. Southwest College of Naturopathic Medicine is dedicated to the idea that every person deserves high-quality fully integrated healthcare and creates an impact on the world through providing a private non-profit education in the culturally rich state of Arizona. Donna: And how old are you James? Donna: Yeah, 15 in February. So, we came to Stem Cells last September and since then, the changes we’ve seen in James is that his math has really improved. For the first time he got two B’s at the end of last year for school. And then this year he had a target to get 70% mark by June of this year, but he actually got it when, James? James: This month – for math. Donna: For your test? And what have you noticed with the stem cells? What things have you found easier? James: Getting ready for school. Donna: And what about your homework? James: I’m completing my homework on time. Donna: And so what we found at home is James is being more self-directed so instead of coming home and struggling to get through all the homework, he’s come home and sort of had that forward awareness where, “I’ve gotta get my homework done because it’s due tomorrow,” and sitting down and starting his homework unassisted, which has been a huge change. And what about with other people? What changes have you felt? James: I’m talking to more people. Donna: And are you less shy or more shy? Donna: Ugh Huh. And what happened on this trip to Panama? James: I made some friends. Donna: It’s a first. As all the parents know, making friends is the hardest thing, isn’t it? Donna: Yeah. Reading people is really tricky. So with our home life, with his siblings, there’s been less arguing, more being friendly, more being able to reason, just not getting so uptight and blocked. He can understand others rather than being self-orientated and only interested in what he needs and getting frustrated. He’s starting to see his sisters’ point of view, But… They’re still not right are they? Donna: And it’s those little things. So. James likes to be driven to school, but when I say, “No, you gotta go catch the bus,” he normally would have resisted and waited and waited, but what I’ve notice between the last stem cell visit and this visit is the ability for him to reason, “Okay, mom’s not going to drive me to school today. I just have to get ready and go.” Whereas before, he’d just wait, and just wait until someone just gave in, or at least walked him to the bus stop to get the bus. And what about coming home from school on your own on the bus? Donna: And what about walking with the other boys? James: I talk to them more. Donna: And do you sometimes walk and get off the bus with the other boys and come the other way? Donna: So, it’s like he can get off at a stop where boys from his school get off together, and that’s a very new thing to go, “Oh, I need to be…” We all said, “You need to be in a group. You need pals.” What are you nudging me for? What’s the best thing about coming to Stem Cells? James: The people and it doesn’t hurt. Oh, bringing your parents. Donna: Exactly! Being on holidays with mom. So if you want a great holiday, leave the kids. Leave the husband. Just come with your boy. Hi. My name is Jennifer and I’ve been diagnosed with multiple sclerosis (MS) since 2003. I started coming to the Stem Cell Institute last year, 2017, in January. My second treatment was in August of last year and now I am here for my third treatment [May 2018]. From my first treatment, I saw major improvements as far as being able to stand without wobbling or bouncing back and forth. I also can feel my toes. I also have more bladder control. The second treatment, I didn’t really see much improvement like I did the first. The first was major. But now I am here for my third and I’m trying to go within six to seven, eight months the most in between my treatments until I see, let’s say 70% improvement. So, thank you and I support the Stem Cell Institute, and I feel strongly that I wouldn’t be where I am here today. I would have been in a wheelchair. Interview with the parents of Brady B, during his second round of stem cell therapy for autism at the Stem Cell Institute in Panama using *umbilical cord tissue-derived mesenchymal stem cells. Interviewer: Today is December 22nd 2017. Please give your names. Michele: Steve and Michelle Bacon and this is Brady. Michele: Brady was diagnosed when he was two and a half with autism. Interviewer: So, this would be his second stem cell treatment? Interviewer: The first treatment was performed when? Interviewer: Can you describe his improvements? Steve: When Brady was diagnosed he was, or is diagnosed as non-verbal. So that was a complete surprise that he came up with a spontaneous 3-word phrase. Michelle: And before that, he had only been doing like “echoing” and a lot of it was not understandable to everyone. I mean, we understood because we know him but other people wouldn’t have been able to understand. Steve: Since stem cells, he’s become more patient and able to wait for things and not have to quick go and do something. He can stand in a line and wait now. Michelle: He’s more… His school reported that he is more tolerant of transitions, like when they’re transitioning from a preferred activity to, like, work, like a work sheet – school stuff. Michelle: About 30. Yeah, he can read words now. He wasn’t able to do that before. He can… It started out just recognizing like, from an array of three pictures, and then he would have like, “apple” or “banana” and he’d have a horse and a pencil and a banana and he cold match the word “banana” to the picture. And he would trade out the words and he could correctly identify which word went with which picture. And now, all we need is the flashcard of the word, no pictures, just like “horse” or “yellow”. And he can identify about 30 words. 30 or 40 words. Steve: And he can now read some simple sentences with the sight words in it that he knows. And this is all new since stem cell treatments. Michelle: Yeah, a lot more tolerant. Eye contact is better. He seeks out peers to play now whereas he didn’t before. Greetings are better – like “Hi” and “Bye”. Still working on the eye contact though. That one’s still kind of tough. He can look at you in a mirror, do eye contact in a mirror but the face is a little hard still. Interviewer: Ok, anything else that you’d like to mention? Steve: More interactive with peers and family members. Michelle: He’s definitely more interactive with everyone. Michelle: And no.. Oh yeah! He used to, it was hard always to get him to come out of his room. He would just want to sit in his room and play on his iPad and now he actually comes out and he sits with us a lot more. And he’s a lot more interactive with the family. We used to have a hard time getting him to stay at the table for dinner and now, he stays at the table no problems. He used to have meltdowns that would last 20 or 30 minutes. Now, he turns around in like, a minute. It’s so much better. His temperament is a lot better. I mean, he’s always been a very good boy but he gets rigid about things, you know? If he doesn’t have it just that way, it’s a 20 – 30 minute meltdown – before. Now, it’s much better. Interviewer: Ok. That’s it. Thank you very much. 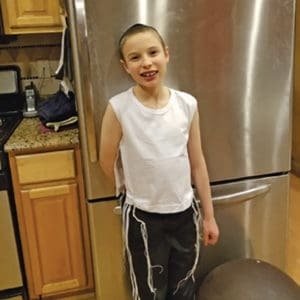 Following Ari Goodman’s first stem cell therapy last year, to treat what doctors called severe low-functioning autism, The Jewish Link reported on his progress and his family’s hope that they would be able to help him continue his journey towards recovery. Ari was first diagnosed seven years ago, after he began losing skills at the age of 18 months. His mother, Clara, and father, Daniel, a 1990 graduate of Frisch who grew up in Parsippany, explored all therapies available to Ari, but nothing was able to reach him. The family persevered, finally learning of the Stem Cell Institute, a facility in Panama that was known for successfully administering stem cell therapy to patients with autism. Clara and Daniel were determined to help Ari receive that treatment but, with the procedure and other costs totalling nearly $20,000, they feared it was beyond their reach. Clara, ever her son’s champion, reached out to The Jewish Link, seeking assistance in sharing her family’s story, and the response went well beyond what they imagined. The Goodmans, residents of East Windsor, were able to take Ari for his first treatment in May of 2016, and the results, noted Clara, were “miraculous.” Within weeks the family saw Ari begin “coming back to us. We started to see changes,” she said. Feeling eternally grateful to the greater Jewish community for its help, and hopeful for the first time in years, Clara again reached out, in December of 2016, through a follow-up article in The Jewish Link. This time the Goodmans were not surprised by the outpouring of support, but just as grateful. “It is amazing how many people are right there with us. Everyone who has cared about our story has helped in some way,” Clara remarked. Clara reports that Ari is now able to spontaneously ask for things and express wants and needs, though still only using one word at a time. “He has a sense of humor now. He laughs,” she said. He is able to read sentences, and can spell words and put them together to form sentences. In fact, at school Ari is no longer in the class for children with autism; his progress has allowed him to move to a class for students with “multiple disabilities,” where the students are more social and conversational. His teachers have told Clara that Ari adds much to the classroom, and both students and teachers enjoy having him there. In the meantime, the Goodmans believe they must continue these treatments. “The stem cell therapy is allowing him to respond to all the therapies that weren’t working before. His body is healing and is open to it now,” added Clara. Clara hopes that her family’s journey will provide strength to others who have children with autism. “There is an answer. Don’t ever give up on your child,” she said. To help the Goodman family provide another stem cell treatment for Ari, please visit www.gofundme.com/aristemcelljourney or, to make a tax-deductible donation, send a check payable to “Congregation Toras Emes,” with “for Ari Goodman” noted in the memo line, and send ℅ Clara Goodman to 523 Nettleton Drive, East Windsor, NJ 08520. Host Michael Beattie discusses stem cell therapy using *human umbilical cord tissue-derived mesenchymal stem cells (hUCT-MSCs) at the Stem Cell Institute in Panama with renowned applied stem cell scientist and founder, Neil Riordan, Pa, PhD and acclaimed actor, director and producer Mel Gibson. Dr. Riordan discusses the miraculous progress of a spinal cord injury patient and pilot whose doctors said that he would never walk again. He talks about where the stem cells come from, how they work and why they can treat so many seemingly different conditions. Dr. Riordan explains how umbilical cords, and subsequently, hUCT-MSCs used at the Stem Cell Institute are carefully selected using molecular screening. He also discusses why mesenchymal stem cells from umbilical cords function better than MSCs from adults, especially as they age or if they are suffering from a disease like multiple sclerosis. For example. MSCs from a newborn multiply exponentially compared to MSCs from an older adult. Mel Gibson discusses his father’s miraculous recovery, literally from his deathbed after receiving hUCT-MSCs at the age of 92. He’s currently 99 and still going strong having been treated in Panama several times since then. Mel also discusses his personal experiences in Panama. Watch all this and more. Want to learn more about how stem cell therapy is disrupting medicine and transforming lives? 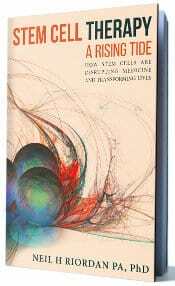 Purchase a copy of Dr. Riordan’s new book about stem cell therapy today! Joe Rogan, Mel Gibson and Dr. Riordan discuss stem cell therapy at Stem Cell Institute.